Should Babies and Children Have Cultured Foods?Can Rejuvelac Help with Alcoholism? Sourdough was one of the last cultured foods I tried. I found it had more of a learning curve than the other cultured foods but wasn’t hard, just new. I didn’t have anyone to help me and it was trial and error till I figured it out. When I did – wow! It became my favorite thing to make. There is nothing like taking flour, sourdough, water, and salt and turning it into something that fills the house with smells that can only be described as heavenly. It was a fiction book (Sarah-Kate Lynch’s By Bread Alone) that finally made me take the plunge and learn this artisanal method of making bread. I am an avid reader and I read tons of books, at least one a week; but if the books are about food they find their way to me. Put a recipe in a story and I am hooked. The woman in this book made sourdough bread every day and would get up every morning to see her sourdough starter bubbling. She lived in a house that used to be a windmill. (see picture) It’s quite a tale with a lot of adventure, but in the end she starts living again and making sourdough bread. They had a recipe in the book for sourdough bread and I couldn’t help myself. I had to start making sourdough bread, and after my first successful loaf I was hooked. Sourdough has so many health benefits, but the truth is that this book was my inspiration. And this led me to discover so many things that sourdough bread could do that other breads could not. So, however the powers that be inspired me to make this wonderful food, I am grateful because it is one of my greatest pleasures. Here are the many reasons I think sourdough bread is one of the best choices if you are going to eat bread. During the making of sourdough bread, complex carbohydrates are broken down into more digestible simple sugars, and protein is broken down into amino acids. Enzymes develop during rising. These enzymes are not lost while baking since the center of the loaf remains at a lower temperature than the crust. Sourdough bread rates a 68 on the glycemic index as opposed to the rating of 100 by other breads. Foods that have low ratings on the glycemic index are regularly consumed in societies that tend to have lower incidences of diseases such as diabetes in our culture. Several studies in Finland found that the live probiotics Lactobacillus, which is in sourdough bread, was able to inhibit the inflammatory response. This means that the probiotics reduced gut distress caused by the inflammatory response to the gluten that was eaten. These results have been confirmed by other research. Because of the long fermentation times, breads made with a sourdough cultures will slowly build the population of friendly Lactobacillus bacteria in the gut. These friendly bacteria help with digestion and proper elimination. Many who are gluten sensitive or have food allergies can often handle sourdough breads, but only if their guts are healed. Now, not everybody who is gluten intolerant can handle it right away. They need to heal their guts first with cultured foods on a regular basis. After this occurs, I have seen so many people thrive when eating breads – so long as these breads were made with sourdough. 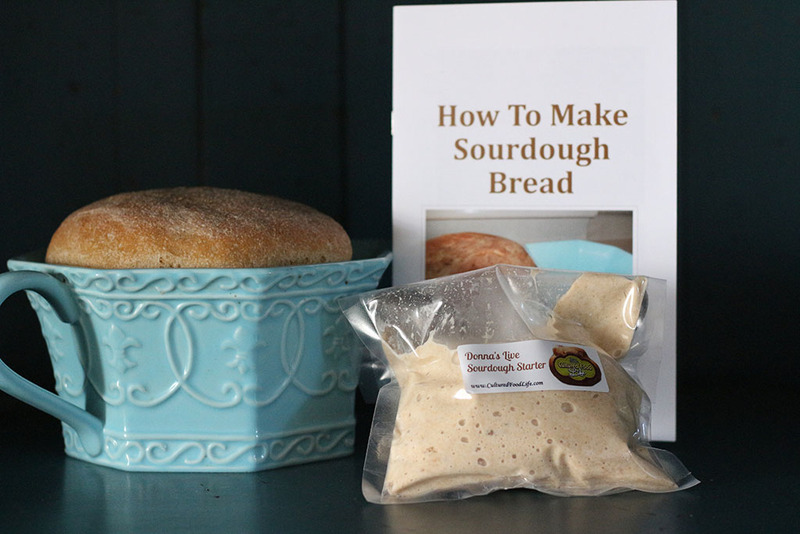 When you use a sourdough starter to make bread, it deactivates the inhibitors that are in the grain and increases the bioavailability of nutrients. Phytic acid, which is a known mineral blocker, is present in the bran (the coating of nuts and seeds) of all grains and inhibits the absorption of calcium, magnesium, iron, copper, and zinc. This inhibitor can neutralize our own digestive enzymes, resulting in the digestive disorders experienced by many people who eat breads that are commercially made. Phytic acid is broken down in the rising process by the bacteria in the sourdough culture. In addition, complex sugars responsible for intestinal gas are broken down during the long, slow rise of the bread. 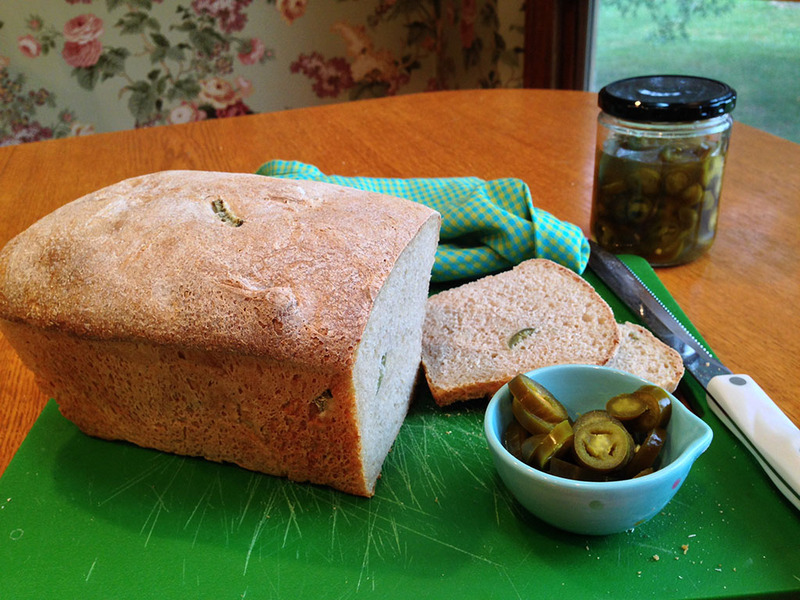 Jalapeno Sourdough Bread is my latest creation and it is to die for. I made this for my son, DJ, who loves jalapenos. I always have a jar of fermented jalapenos in my fridge for him when he comes over. The first time I made this, he looked at me and said, ” Mom this is crazy good and can I take the loaf home?” Needless to say, we ate the whole loaf in one night. 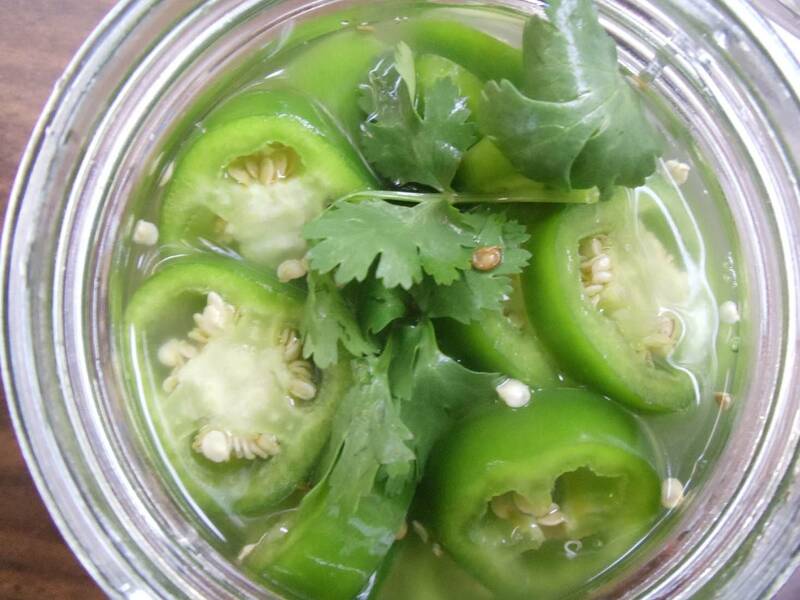 It’s super spicy and has a delicious flavor that you can use for sandwiches or you can serve it with chili. 21 Responses to "Fermented Jalapenos and Sourdough Bread"
is there a way i can ferment the jalapeños simply with celtic salt and a bit more time? is i massage them and then just tuck them away for a couple weeks maybe? This didn’t work for me when I tried it. Can I make sourdough bread using sprouted oat flour, or does it need to be in the wheat family? You don’t need to use sprouted flour to make sourdough because it works better to use un sprouted since sprouted has already had the bacteria do the work and transform the flour. I believe you can use oat flour but I am not sure how well it will rise. I want to come and live with you for a month or so… Not only would my health improve but also my knowledge and skill. I really do not like to cook much. I do make kefir, kombucha, and sauerkraut but do not feel like my health is improving much at all. Sourdough sounds wonderful but appears to be a lot of work for someone who doesn’t like to cook. Can you make it in a bread machine? I don’t recommend a bread machine because the bread rises differently according to the temperature in your house and the strength of your starter so its best to watch it rise and then bake it yourself. are there pictures of the mold that might appear on the cultured vegetables? Donna, I have made three attempts at making sourdough bread and it tastes fine, but doesn’t raise well. It raises nicely until I put it into the bread pans. And I noticed that you specified glass baking dish, my bread pans are metal, will that cause the problem? I use my Kitchenaid mixer as well which has a metal bowl. Is this a problem? I LOVE your site! I used to make kefir years ago and have started again. It is great to see all the cultured foods in one place with such great instructions! Your starter is probably not strong enough. DO you feed it often? The pan shouldn’t matter at all it is in the starter. Wow! Just finished my first piece of homemade sourdough using your recipe, what a difference!!! LOVE this bread and will continue to use this recipe instead of the one that came with my King Arthur starter. It is light, spongey and DELICIOUS! Thanks so much!! You are a true gift to the world! Is there anything wrong with using kombucha mother as starter for cultured vegetables? thank you! It will change the types of bacteria you will get and I have never tried this so not sure of it will turn out. Also, here’s an interesting book I thought of, while reading your comments. I read it many, many years ago when I first moved to New Mexico: The House at Otowi Bridge, by Peggy Pond Church. It has a lot to do with her interactions with the Los Alamos crowd who built the first atomic bomb. Food was a big part of those interactions, and there is a recipe for her chocolate loaf cake in the book. Her observations and memories of those days are priceless. Written in 1959, I believe. Wow! My son will be ecstatic about spicy sourdough. We are big sourdough fans so adding some jalapenos, which no-one else will eat other than my son, means he gets the whole loaf to himself – his own personal heaven . Can’t wait to make this – but I’d better or else I will be up all night! PS Also love the fact that fermented doughs have a lower glycemic index. Just finished reading your article on sour dough bread and I loved it. Just wondering about “white whole wheat” flour. Can you please explain how your white flour is whole wheat? The term white flour generally sends out alarm bells for me as it relates to processed, low nutrient foods. The term “white flour” has often been used to mean “refined flour,” so “whole white wheat flour” sounds like a contradiction in terms. 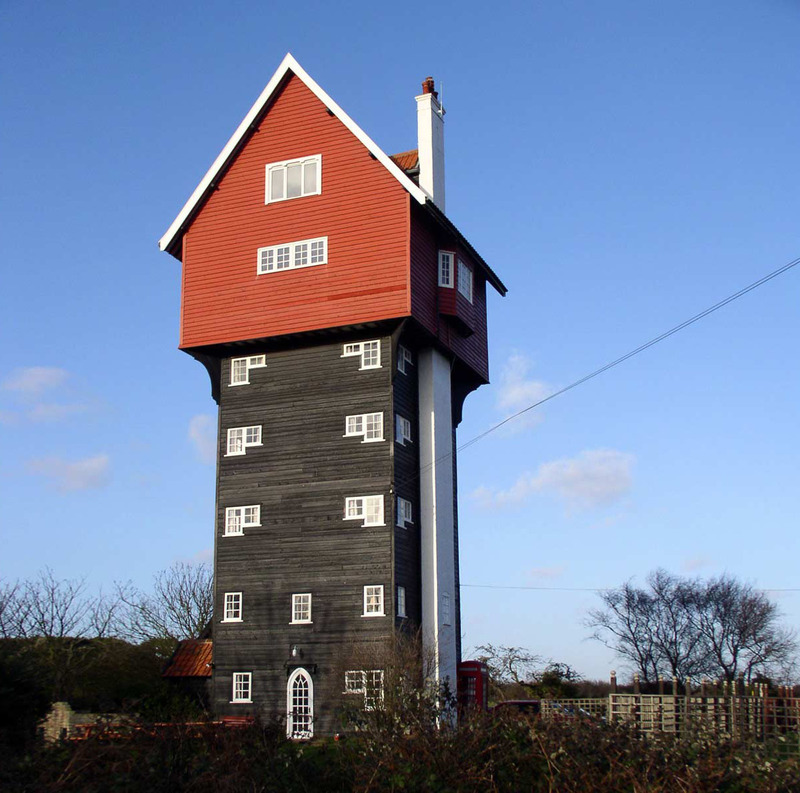 But it is simply WHOLE flour – including the bran, germ and endosperm – made from WHITE wheat. Well, I am coming around to your way of thinking by starting with kefir (which I love probably too much!) and The Picky Eater’s cultured veggies, but how can there be any nutrients in sourdough bread when the grain (wheat) has gone through so much processing and then baking? Just watched a video from a notable doctor who says to rid ourselves of all disease we must stop eating all animal products. I was a vegetarian for decades and then started eating wild salmon and kefir. I felt great then and I feel great now, so I never know what to think other than listening to my own body.